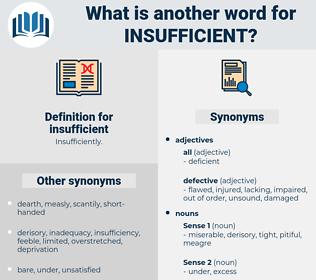 What is another word for insufficient? insubstantial, ineffective, defective, flawed, substandard, insignificant, underdeveloped, lacking, kefaya, unachieved, faulty, underemployed, unsuitable, Underemployment, necessary, sub-standard, underrepresented, imperfect, undersized, lacks, unable, under-funded, fuller, feeble, proper. malfunctions, data, submissions, lack, lacks. 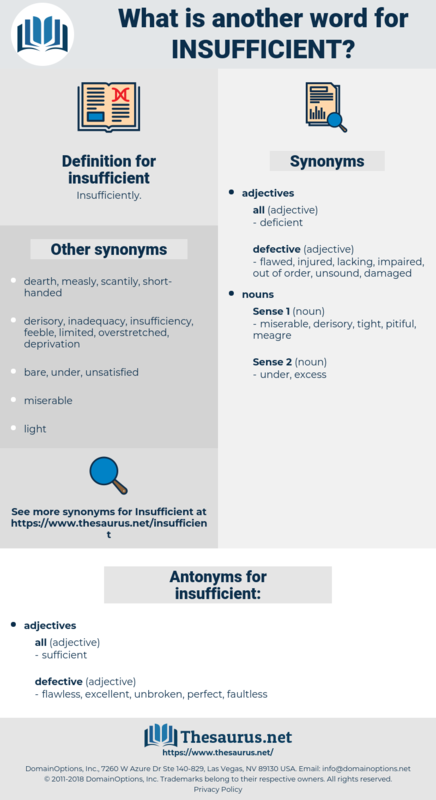 inefficient, scant, scarce, little, inappropriate, ample, satisfactory, few, poor, appropriate. flawless, excellent, unbroken, perfect, faultless. healthy, strong, rebounding, thriving, ok, well. able, effective, powerful, hardy, solid, hearty. bountiful, bounteous, king-size, copious, large, substantial, hefty, super, rich, big, largish, abounding, expanded, jumbo, oversize, liberal, luxuriant, abundant, overflowing, decent, plenteous, tolerable, enlarged, generous, comfortable, teeming, considerable, lavish, sizable. We had a very insufficient supply of ambulance waggons. The usual point of view is that man desires happiness and for this morality is a necessary though insufficient preparation.